OAKLAND — Yusuf Bey IV kept a hit list of people “he wanted to get rid of” who had “done stuff to” Your Black Muslim Bakery, according to a statement Devaughndre Broussard gave authorities in preparation for grand jury testimony next week. Bey IV, Broussard said, ordered him and another man, Antoine Mackey, to kill Bailey and gave them the sawed-off shotgun that Broussard used to carry out the killing, according to the transcript, which the Chauncey Bailey Project obtained. Bey IV wanted to stop an article Bailey was writing about the bakery’s financial problems and internal strife, according to the statement. Broussard said that in exchange for killing Bailey, Bey IV told him and Mackey he would help them fabricate credit reports that would allow them to acquire large loans they wouldn’t have to pay back. Bey IV, Broussard said, hated Bailey because of stories the journalist wrote about his father, bakery founder Yusuf Bey, and even blamed Bailey for the elder Bey’s 2003 death from cancer. “That’s the (expletive) that killed my dad,” Broussard quoted Bey IV as saying. Bey IV has long been suspected of ordering Bailey killed. Broussard was arrested a day after the shooting and confessed, then recanted, police said. He has agreed to plead guilty to manslaughter charges for killing Bailey and another man, Odell Roberson, on Bey IV’s orders. In exchange for a sentence of 20 to 30 years, Broussard has agreed to testify that Bey IV ordered Bailey killed and that Mackey helped carry out the crime. He will also testify that Mackey killed another man, Michael Wills, in July 2007. Bey IV has denied involvement in Bailey’s death. He is jailed awaiting trial on a host of charges, including kidnapping and torture. Mackey is in state prison on burglary charges. Broussard’s agreement comes 20 months after Bailey died in a quick succession of shotgun blasts near downtown Oakland. Police said almost immediately that others were involved in the killing. But the lead detective on the case, Sgt. Derwin Longmire, failed to document evidence that pointed to a conspiracy involving Bey IV to carry out the killing. A lengthy internal affairs investigation of Longmire found he compromised the case. He was suspended Monday and the department is moving toward firing him. His lawyer has said he did nothing wrong. Bey IV has been secretly recorded by police saying that Longmire protected him from charges. A confidential informant told investigators that Bey IV bragged in jail that Longmire was a bakery sympathizer. Before obtaining Broussard’s confession, Longmire left Bey IV alone with Broussard in a police interrogation room. After that, Broussard said he shot Bailey but acted alone. Broussard’s attorney, LaRue Grim, said his client is remorseful over his actions and is no longer loyal to Bey IV. Prosecutor Chris Lamiero could not be reached. Broussard agreed last month to cooperate with an aggressive investigation by the Alameda County District Attorney’s office and has described the killing in detail. Broussard said Bey IV told him not to miss “’cause if you miss, they coming down on us hard.’ I was like whatever. “That’s like saying, like (Michael) Jordan, how you expect me to miss a free throw?” Broussard said. 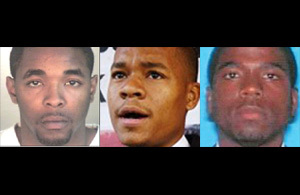 Bey IV told Mackey and Broussard to “go sit on him, go baby-sit him … find out where he stay at.” The three even staked out the Oakland Post’s offices at 14th and Franklin streets, Broussard said, where they saw a car belonging to a former bakery member, Saleem Bey, who has said he was Bailey’s source for the story about the bakery. Bey IV became upset when he saw Saleem Bey’s car, Broussard said. “‘That (expletive’s) up there talking to him right now,”‘ Bey IV said, according to the transcript. Broussard and Mackey later followed Bailey home and parked outside his apartment. Bailey came outside and Mackey called Bey IV, but rather than kill him, the pair returned to the bakery. Broussard said Bey IV gave him a sawed-off shotgun. But Broussard was so nervous with it that he accidentally fired a round, blowing a hole in a wall and nearly injuring himself. A few hours later, Broussard said, Mackey woke him up and said it was time to go carry out the hit. They missed Bailey at his apartment, but they caught up to him on 14th St.
Broussard said he then fired the shotgun and Bailey “hit the ground.” Later, Broussard said Bey IV wanted to know all the details about the shooting, including a description of a gaping head wound Bailey suffered. Thomas Peele is an investigative reporter for the Bay Area News Group. Reach him at tpeele@bayareanewsgroup.com. Bob Butler and Mary Fricker are independent journalists.